Just Shutters has been built on core family values. Ultimately, we were born from a family business. Through our network of wonderful, like-minded franchisees, we have grown in line with our ethos. It is great for us, for our franchisees and moreover our customers! Over the last few years we have seen an increase in interest among husband and wife partnerships. We now have 19 local family franchises with five actively headed by husband and wife duos. Here are a few of our most recent additions to the family! 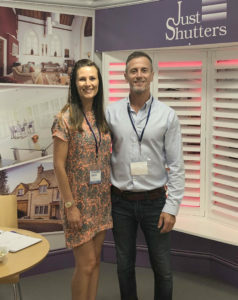 Alongside Ken and Angela, we have the equally delightful Simon Broadhurst and his wife Georgina (pictured right) who are our Just Shutters Surrey franchisees. Originally Simon was at the helm with a little help from Georgina. However, very quickly Gina too was able to give up her London city job and join Simon in, what is now, a thriving family business that has also just taken on an employee. -James and Charlotte Chenery, Oxfordshire franchisees. -Tom and Brook Parrott, our Hertfordshire’s franchisees. 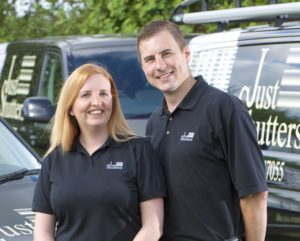 -Hayley and Terry Lancaster, our Essex franchisees (pictured below). We are so proud that throughout the country our local experts look after customers with the same brand values as we start ed with. We understand the very best of ‘old-fashioned’ customer service. Our brand thrives on providing the best for our customers and our franchisees all benefit from the hard work and reputation of each other. If you share these values and want to be part of a team that is truly special, come and meet us! We would be delighted to have you experience for yourself, what it is like to be part of the Just Shutters family. Call us on 01202 233744 or fill in the form on this page and we shall be in touch.